Camilla Nylund has established herself as one of the world’s leading lyric-dramatic sopranos. Her title role debut in ‘Rusalka’ at the Salzburg Festspiele in 2008 with the Cleveland Symphony Orchestra under the direction of Franz Werner-Möst garnered rave reviews, gaining acclaim from the international press. The Finnish soprano regularly appears with world-renowned orchestras and conductors and has sung leading roles in opera houses in Zürich, Vienna, Paris, Berlin, Dresden, Köln, Hamburg, Tokyo, Helsinki, Barcelona, San Diego, Amsterdam, Bayreuth, San Francisco, London and Milan. Ms. Nylund’s international breakthrough was in the 2004/2005 season with various role debuts: as Elisabeth (‘Tannhäuser’) at the Bayerische Staatsoper, as Salome in Köln and as Leonore (‘Fidelio’) at the Opernhaus Zürich. All three have become signature roles in her repertoire. She has performed the title role in ‘Salome’ in various productions at the Wiener Staatsoper, Opera Toulouse, Opera Valencia (under the baton of Zubin Mehta) and at the Dresden Semperoper including a tour throughout Japan. Her 2009 debut at the Bastille in Paris as Salome was a tremendous success. 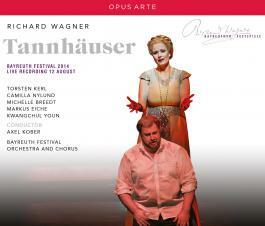 Singing the role of Elisabeth in ‘Tannhäuser’, Ms. Nylund made her debut in 2011 at the famed Bayreuth. Additional engagements of ‘Tannhäuser’ followed at the San Diego Opera, Oper Köln, Festspielhaus Baden-Baden (including a live DVD recording) and a tour throughout Japan at the Semperoper Dresden. As Leonore in ‘Fidelio’ she sung in Theater an der Wien, Opernhaus Zürich and was engaged by the Osterfestspiele Salzburg for a tour through Japan under the baton of Sir Simon Rattle. The title role in Dvorak’s ‘Rusalka’ has been coupled with many significant debuts. In 2008 Ms. Nylund sung for the first time at the Salzburg Festspiele, receiving critical acclaim for her performance. In 2011 she made her debut at Covent Garden in London and in 2012 she made her debut at the Liceu Barcelona. Additionally, Ms. Nylund is well-known for her interpretation of Elsa in ‘Lohengrin’. After her role debut in 2006 at Oper Köln, she went on to perform Elsa at the Semperoper Dresden, Wiener Staatsoper, in a concertante version in the Concertgebouw in Amsterdam and in 2013 in a highly successful production at the San Francisco Opera. Throughout her career Ms. Nylund has performed in numerous Strauss and Wagner operas. She has sung the title role in ‘Arabella’ at the Bayerische Staatsoper, Oper Frankfurt, Vlaamse Opera and the Wiener Staatsoper, Chrysothemis in ‘Elektra’ at De Nederlandse Opera, Gräfin in ‘Capriccio’ at Oper Köln and in Venice, and the title role in ‘Ariadne auf Naxos’ at the Wiener Staatsoper. As the Marschallin in ‘Der Rosenkavalier’ Ms. Nylund performed in Teatro alla Scala, New National Theatre Tokyo and the Wiener Staatsoper; as Eva in ‘Der Meistersinger von Nürnberg’ she sung at the Hamburgische Staatsoper, Bayerische Staatsoper and the Semperoper Dresden. Other significant opera productions have included ‘Don Carlo’ (Elisabeth) with Dutch National Opera and ‘Eugene Onegin’ (Tatjana) with the Hamburgische Staatsoper. Ms. Nylund has appeared in many new productions including Mussorgsky’s ‘Khovanshchina’ (Emma) at the Bayerische Staatsoper and Lehar’s ‘Die lustige Witwe’ (Hanna Glawari) at the Hamburgische Staatsoper. Her performance in Wagner’s ‘Rienzi’ (Irene) at the Deutsche Oper Berlin was highly esteemed. At the Semperoper Dresden she sung the role of Esmeralda in Franz Schmidt’s ‘Notre Dame’ and the title role in Strauss’ ‘Daphne’; at the Finnish National Opera she sung the role of Marietta in Korngold’s ‘Die tote Stadt’ and recently in 2012 the role of Marja in Aarre Merikanto’s ‘Juha’. In recent seasons she has appeared in productions of ‘Ariadne of Naxos’ (Oper Frankfurt), ‘Die tote Stadt’ (Finnish National Opera), ‘Salome’ (Staatsoper Berlin and Opera Philadelphia) and in a new production of ‘Lohengrin’ at the Wiener Staatsoper. Her performance as Sieglinde in ‘Die Walküre’ at the Wiener Staatsoper was a much acclaimed role debut. Since her debut in Bayreuth in 2011, re-invitations followed in 2012, 2013 and 2014. In 2015 Ms. Nylund will return to Opéra National de Lyon to sing the title role in ‘Rusalka’. Other engagements include ‘Ariadne auf Naxos’ and ‘Der fliegende Holländer’ at Staatsoper Berlin, ‘Der Rosenkavalier’ at Dutch National Opera, ‘Elektra’ at Staatsoper Dresden and ‘Tannhäuser’ at Wiener Staatsoper. In April she will return to the Finnish National Opera to sing the title role in the first Finnish performance of ‘Émilie’, a monologue opera composed by Kaija Saariaho. Concert engagements include Strauss’ ‘Vier letzte Lieder’ with the Orquestra Simfonica de Barcelona, and concertant performances of Beethoven’s ‘Fidelio’ at the Wiener Staatsoper, Strauss’ ‘Elektra’ with the Rundfunk-Sinfonieorchester Berlin and Wagner’s ‘Lohengrin’ with the Royal Concertgebouw Orchestra. Camilla Nylund has appeared in concert with many of the foremost European and American orchestras. She has worked with conductors such as Sir Simon Rattle, Nikolaus Harnoncourt, Frans Welser-Möst, Daniel Barenboim, Christian Thielemann, Esa-Pekka Salonen, Riccardo Muti, Helmuth Rilling, Marek Janowski, Fabio Luisi, Ingo Metzmacher, Osmo Vänskä, Philippe Herreweghe and Jukka-Pekka Saraste. Highlights from her concert appearances have included Beethoven’s ‘Ninth Symphony’ with the Chicago Symphony Orchestra, Berlin Philharmonic Orchestra (Sir Simon Rattle) and with the La Scala Philharmonic (Daniel Barenboim), Schumann’s ‘Faustszenen’ in Berlin with Ingo Metzmacher and Henze’s monumental oratorio ‘Das Floss der Medusa’ with the Berlin Philharmonic Orchestra and conductor Sir Simon Rattle. Recently Ms. Nylund sung Strauss’ ‘Four Last Songs’ with the Oslo Philharmonic under the baton of Jukka-Pekka Saraste. The discography of Camilla Nylund includes more than thirty CD and DVD recordings, available from Sony Classical, Ondine, Hänssler Classic, ArkivMusic and ArtHaus Musik. Recently three recordings have been released on the Oehms Classics label: ‘Ariadne auf Naxos’, ‘Lohengrin’ and ‘Iphigenia in Aulis’. Ms. Nylund collaborated with celebrated tenor Klaus Florian Vogt on the CD ‘Wagner’, which was released in January 2013 by Sony Classical. Additional recordings include Mahler’s ‘Symphony No. 8’ in E flat major ‘Symphony of the Thousand’ with the Royal Concertgebouw Orchestra under the baton of Mariss Jansons and a live recording of Strauss’ ‘Elektra’ at De Nederlandse Opera. Her much-awaited and acclaimed solo album ‘Transfiguration’ with famous arias and scenes by Strauss and Wagner was released in 2011 on the Ondine label. Other CD collaborations have included the role of Leonore in the original 1805 version of ‘Fidelio’, Op 72 with the Vienna Radio Symphony Orchestra and conductor Bertrand de Billy and a live recording of her debut as ‘Rusalka’ at the Salzburg Festspiele 2008. She was also featured on the CD ‘Children First’ in collaboration with various artists to support the work of UNICEF. Ms. Nylund has appeared on numerous DVD recordings. On the Arthaus Musik label Ms. Nylund sung the role of Irene in Wagner’s ‘Rienzi’ (Deutsche Oper Berlin) and the role of Elisabeth in ‘Tannhäuser’ (Festspielhaus Baden-Baden). She can be seen as Leonore in the 2004 Opernhaus Zürich recording of ‘Fidelio’ with conductor Nikolaus Harnoncourt on the ArkivMusic label. In 2007 the DVD of Mussorgsky’s ‘Khovanshchina’ live from the Bayerische Staatsoper was released and in 2002 her first DVD recording, ‘Antikrist’ by Rued Langgaard with the Royal Danish Opera, appeared. A native of Vaasa in Finland, Camilla Nylund received her musical education with Professor Eva Illes and at the Mozarteum in Salzburg. For her outstanding achievement she was awarded the Lilli Lehmann Medal in 1995 by the International Foundation of the Mozarteum. Since 2003 she has worked with Prof. Irmgard Boas. After a highly acclaimed debut at the Niedersächsische Staatsoper Hannover she was engaged as a permanent member of the ensemble from 1995-1999. Ms. Nylund made her debut at the Finnish National Opera in 1996 in the role of the Contessa in ‘Le nozze di Figaro’. From 1999 – 2001 she was a member of the ensemble of the Dresden Semperoper where she sung in numerous operas including ‘Così fan tutte’, ‘Falstaff’, ‘La Clemenza di Tito’, ‘Die Meistersinger von Nürnberg’, ‘Arabella’, ‘Tannhäuser’, ‘Der Rosenkavalier’, ‘Der Freischütz’ and ‘Der Fledermaus’. While in Dresden she was the recipient of the prestigious Christel Goltz-Preis. Until 2011 she made various guest appearances at the Dresden Semperoper and in 2016 she will return to sing Tatjana in Tchaikovsky’s ‘Eugene Onegin’. In 2008 Ms. Nylund was given the title ‘Kammersängerin’ by the state of Saxony. In 2013 she was awarded the prestigious Culture Prize of Sweden for her exceptional accomplishments and the Pro Finlandia Medal of the Order of the Lion of Finland, one of Finland’s highest honours.